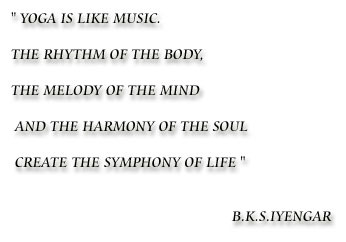 Iyengar Yoga is based on the teachings of the yoga master B.K.S. Iyengar and begins with learning the art and science of asanas, or yoga postures. The method of study is orderly and progressive, and the postures are adjusted to meet the physical needs of each student. An innovative and inspired practice of Yoga, the Iyengar method has been developed by B.K.S.Iyengar during his long career. Firmly based in the ancient Indian tradition of classical Astanga Yoga as defined by Patanjali in the Yoga Sutras, Iyengar Yoga teaches strength and stamina, flexibility and balance, concentration and meditation. Yoga is an integral science in which the search for a developed consciousness begins with physical awareness. In each posture, every part of the body is acted upon with intent and precision. As students learn to extend awareness to each part of their bodies, they begin to explore the vast potential of a disciplined mind and to embrace emotional and spiritual growth.